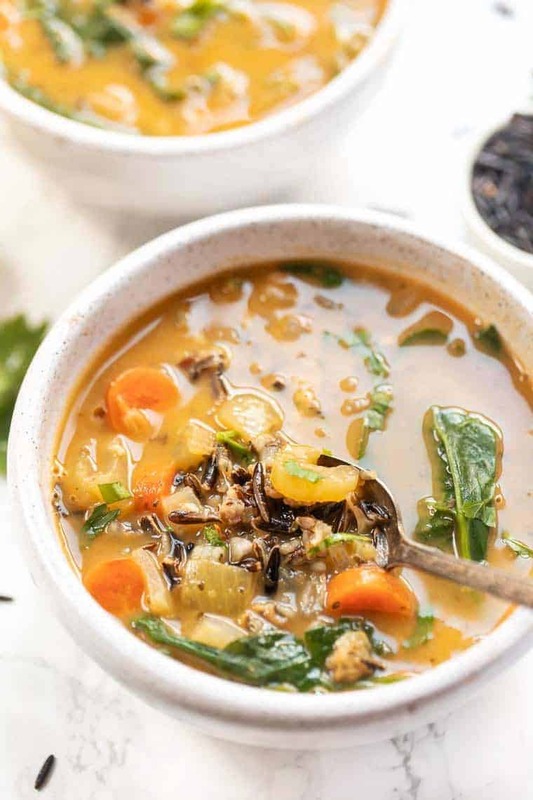 An easy wild rice soup recipe packed with vegetables and flavored with lemon and garlic. 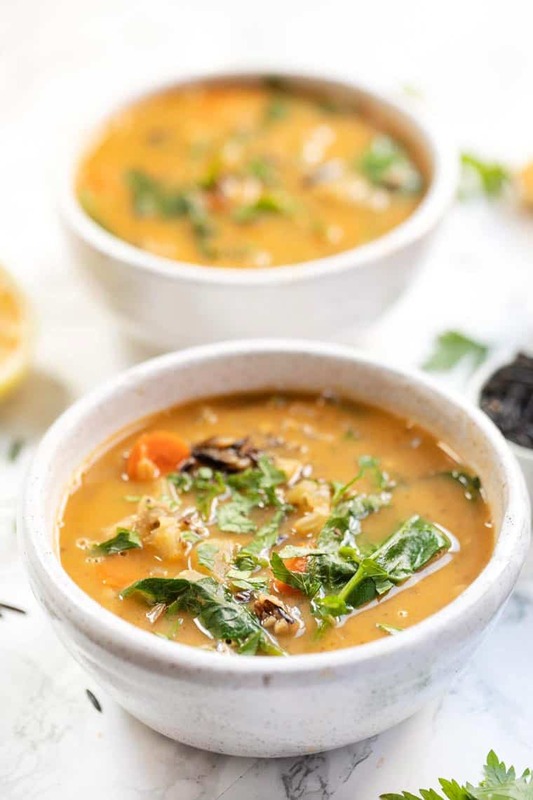 This soup is vegan, gluten-free and the ultimate comfort food. Perfect as a vegan meal prep recipe too! Relationships are all about compromise, right? One of the things I've learned from mine is that in order to get Matt on board with healthy eating, I can't just make the food I like all the time. I need to make things he likes, just with my own healthy twist. This wild rice soup is a prime example of how we compromise. I'm a creamy soup girl through and through (hello, creamy roasted pumpkin soup 👋🏻). I'd so much rather have a soup that is blended and creamy that I can dunk toast into. But he doesn't. He's a brothy soup guy. And since he's also not 100% plant-based, this is something I can make that satisfies us both. It's a rich, cozy, veggie soup, that is broth-based. It's a win-win! One of the things I love about soup is that they're really easy to pack in a TON of veggies without really trying. You can kind of just toss whatever you have on hand/want into the pot, cook it down until it's tender and serve it up. 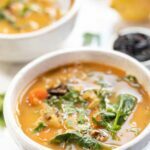 That's what I wanted when I made this wild rice soup – I wanted it to be veggie-packed, but also super flavorful. Sometimes I find that vegetable soups are lackluster in the flavor department. So to amp things up, we're sauteing the vegetables with a LOT of garlic, and also stirring in some lemon zest and lemon juice. The end result is one of my favorite soups to date! Yes, that might seem like a super bold statement BUT it's also true. 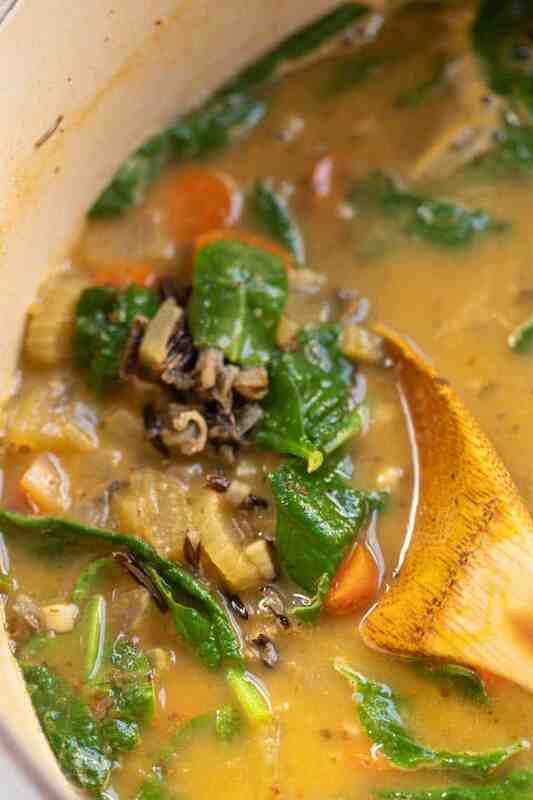 This is hands down the best wild rice soup I've ever made or tasted. I love that we start by sauteing the vegetables which infuses them an almost roasted quality. Next the Italian seasoning. This is probably one of my favorite herb blends – you've got oregano, basil, rosemary, and thyme. It's pretty much the ultimate soup blend! Then there's lemon zest which adds brightness, a bit of tang and rounds it all out. I also love finishing my wild rice soups off with a cup of plant milk. It adds just a little richness but doesn't create an overpowering flavor. You could really use any milk you like – I went with unsweetened almond, but it would also be great with cashew, rice or even coconut! The finishing touch? Some fresh spinach. You get that gorgeous contrast of color, you're able to boost the nutrition even more, it's great for digestion and who doesn't love sneaking in some extra greens where they can!? If I had to make one soup over and over again this winter, this would be it. I loved it, Matt loved it and we enjoyed having leftovers all week long. That's saying a lot because he is NOT a leftovers guy and he actually asked me to pull it out of the freezer and reheat it for dinner a few nights later. 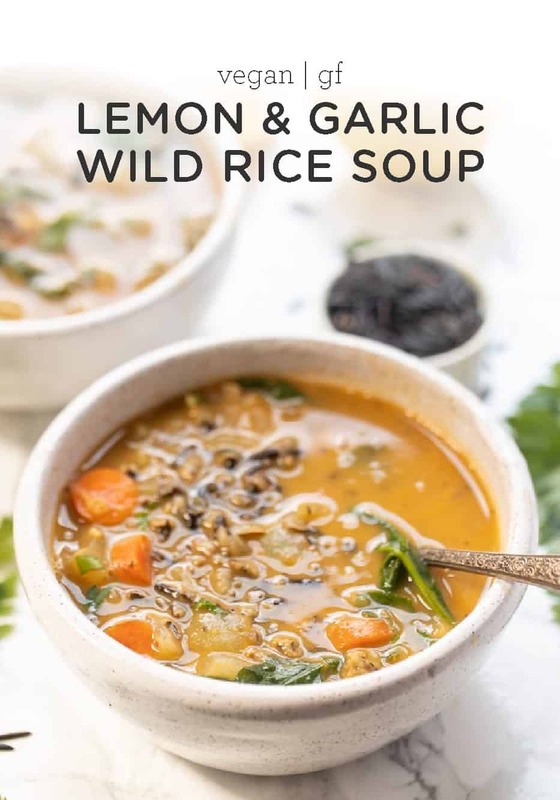 A flavorful wild rice soup that is packed lemon and garlic. It's nourishing, bright and makes the perfect cozy winter meal. Heat the olive oil in a large pot or dutch oven. Add the onion, carrots, celery, and garlic and saute until the carrots start to soften, about 5 minutes. Add the seasonings and zest and cook another 2 - 3 minutes. Stir in the wild rice and vegetable broth and bring the soup to a boil. Cover and reduce to simmer, cooking until rice has cooked, about 30 - 40 minutes. Once the rice is cooked and soft, stir in the milk, lemon juice, and spinach. Stir until spinach is wilted. Serve immediately and enjoy! Soup can be frozen and reheated as desired. Loved the soup! I didn’t have any celery on hand but I just added extra spinach and a handful of scallions. Everything else in the recipe was the same. Thank you for this recipe, it is great! Omg I just made this soup and it was AMAZING! I couldn’t quite convince my boyfriend to eat a whole bowl but he, too, loved the taste! Definitely making this a staple soup! I’m so glad you both enjoyed it!! It’s one of our favorites as well 🙂 yayyy! Just made it! It was really good but I felt like lemon was a bit overpowering. 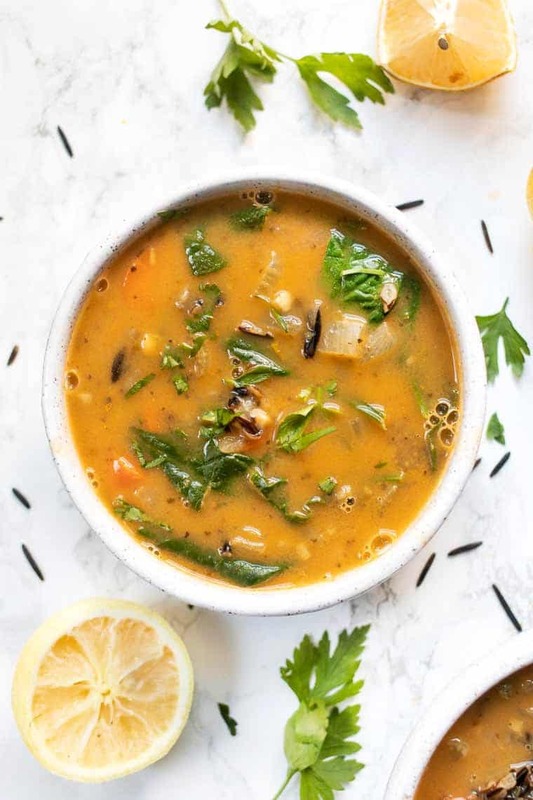 Would love to make this soup but due to a garlic allergy, would shallots be an acceptable substitute and still be flavorful. Love your recipes.